Came across this on the Army Corp of Engineers web site this morning, Their forecast is out for 2019 and looks like we are in for a possible repeat of 2017. I will do some digging around and see what else they have but its odd that they would put this up at all. It was like pulling teeth from the IJC and Army Corp for to give any forecast past 6 months. But they do protect themselves by adding "Experimental 5 year forecast" to the header. Updated forecast into 2019 & Experimental 5 year forecast from the Army Corps of Engineers. This reading looks encouraging, unless we monsoon rains we should be about the same as last year or even lower as we are roughly .2 meters lower. Hi Scott it does look encouraging but still it would be better to see more of a drop. The eastern shores of Lake Ontario are still taking a beating every time we have a storm from the west. Now we re-start the cycle, the level will slowly raise depending on the weather conditions. Thanks for the updates! Council is applying for federal climate adaptation grants to help prevent high water levels and storm surges from eating away at its popular waterfront trails. Hamilton faces an estimated $30-million bill to fix and protect shorelines battered by storms and record high water levels. The city hired a specialized consultant to evaluate the damage along the city's harbour and Lake Ontario shorelines following historically high water levels in 2017, and follow-up storms that drowned sections of waterfront trail, flooded beach strip streets and washed away sensitive sand dunes. The experts recently returned with a $6.8-million estimate to fix and stormproof the section of asphalt path that follows the west side of the harbour from Cootes Paradise to Bayfront Park. 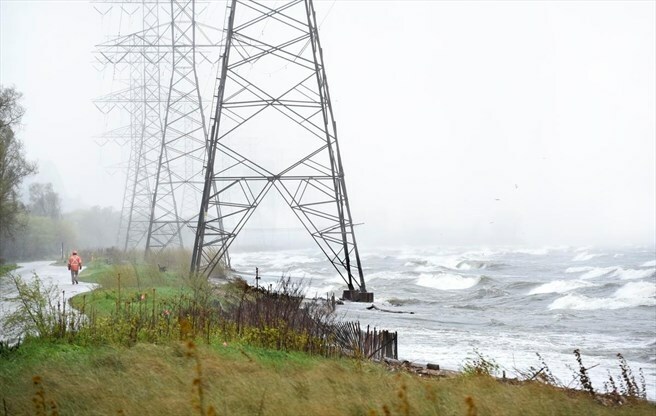 Studies continue on how to deal with the eroded and storm-chomped Lake Ontario shoreline stretching from the Burlington Lift Bridge all the way past Confederation Park into Stoney Creek. But early "high-level" estimates prompted council this month to apply for a $30-million federal grant for shoreline protection work. "I knew it was going to be a lot, but I'm sure it's a shocking number for people at first glance," said Coun. Chad Collins, who represents Ward 5 and the beach strip battered by successive storms. "Anyone who lives along that shoreline, they know the waves in the right circumstances can be very destructive. And some of the storms we've seen in recent years have been out of this world." While high water levels in 2017 flooded trails and parks for long periods, some of the worst damage came in early 2018 when a vicious wind-driven ice storm took huge bites out of the lakeside trail leading to and through Confederation Park. Longtime resident Jim Howlett said he watched waves overtop the trail leading behind beach strip homes. "I don't think we've seen that since the early '90s," he said at the time. While the city has completed basic repairs to most of the damaged trails — sometimes by rerouting them around storm-chomped holes in the shoreline — there is "little wiggle room" along some sections of the beach strip where homes are just a few metres from the water, Collins noted. "If this is the new norm, no doubt we'll need to be looking at wholesale design changes (to the waterfront)," he said. It's not clear yet what the consultant will recommend for the Lake Ontario waterfront. Along the harbour, suggestions include building up the level of the asphalt path and costly slope excavation and protection along the water-hugging trail. Collins said a recommendation to "harden" the waterfront with armour stone or seawalls — like along the downtown Burlington waterfront, for example — would likely spur a debate over the pros and cons of maintaining the current natural look and function of the shoreline. The city is applying for nearly $63 million in federal cash from a disaster mitigation and adaptation program meant to acknowledge the challenges of climate change for cities. That grant money would help — but council would still have to come up with its own matching millions, Collins noted. Right now, only $150,000 is immediately budgeted next year for design work. The Waterfront Trail has witnessed a daily average of 954 users this year — a number that spikes over the warmer months. As we approach a new year, I will give you my prediction for 2019 which is " we will see flooding again " as bad as 2017 is hard to say? That will depend on how fast the ice clears out of the St Lawrence and what bad spring storms we get. But the possibility of flooding is still as great next year as it was this year. The IJC released a record amount of water from Lake Ontario thru the Moses Saunders dam this year and will continue to do the same next year. The other great lakes are still holding a record amount of water and this still needs to pass thru Lake Ontario. This past years record release of water made a small dent in the overall inventory of water within the great lakes system. all the best for 2019 ! Looking at the readings you have posted that we are on our way to much the same as this past year. December is very close, so hopefully we never see the levels of 2017 again. First article caught my attention solely for the fact that the IJC is deviating from its plan governing the lake to offset the effect of high water levels- causing shoreline erosion and costal damage. This leads me to the second article regarding the Great Lakes water levels and make you wonder how will Lakes Michigan/Huron handle the influx of increased water flow when they are way above capacity ?? December, like October and November, saw wet conditions across the upper Great Lakes basin, and water levels of Lake Superior and Lake Michigan-Huron remain well above average. The above-average levels coupled with strong winds and waves continue to result in shoreline erosion and coastal damages across the upper Great Lakes system. Additional shoreline erosion and coastal damages may occur this winter should active weather continue. Lake Superior declined 7 cm (3 in) overall last month and Lake Michigan-Huron declined 2 cm (1 in), which are both below average declines for December. On average, Lake Superior declines 8 cm (3 in) and Lake Michigan-Huron declines 5 cm (2 in) in December. At the beginning of January, Lake Superior is 29 cm (11 in) above average (1918 – 2017), and 5 cm (2 in) below the level at this time last year. Lake Michigan-Huron is currently 52 cm (20 in) above average, and 8 cm (3 in) above last year’s beginning-of-January level. Both Lake Superior and Lake Michigan-Huron are expected to continue their seasonal declines in January. In consideration of the continuing high water levels in the upper Great Lakes, and to accommodate expected maintenance at the hydropower plants, the International Lake Superior Board of Control (Board) recently requested and received approval from the International Joint Commission (IJC) to temporarily deviate from Regulation Plan 2012 this winter. All three hydropower plants will continue to be directed to flow at their maximum available capacity, but the total combined capacity is expected to be less than normal due to required maintenance activities in December and continuing into January. To offset the effects of these activities, over the winter months the Board will release more water through the control structure at the head of the St. Marys Rapids by maintaining a gate setting equivalent to two gates fully open instead of the typical winter setting equivalent to one-half gate open. As a result, flows less than Plan 2012 are expected in January, while flows greater than Plan 2012 are expected later in winter as hydropower maintenance is completed and capacity returns to normal. 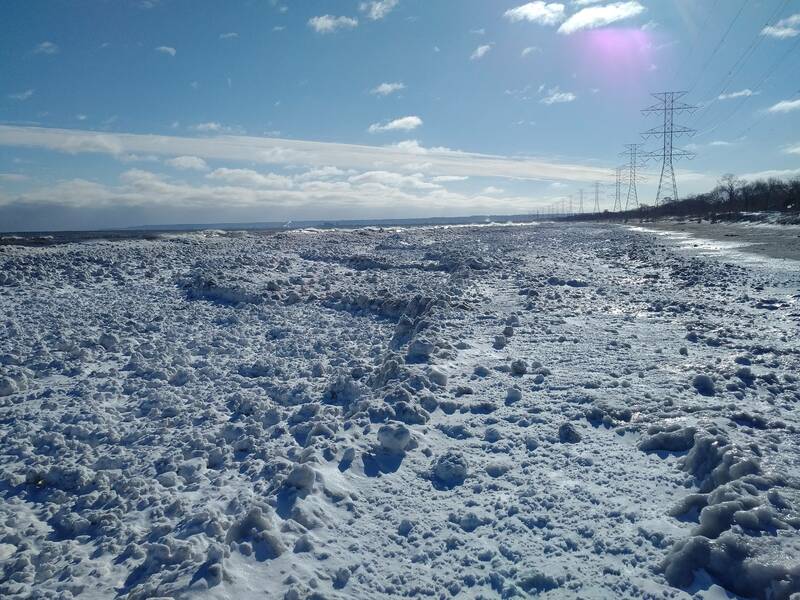 The total amount of water released through the St. Marys River this winter will be approximately equal to releases called for by Plan 2012, and the net effects on the water levels of Lake Superior and Lake Michigan-Huron are expected to be minimal by spring. The Board expects the total flow in January to be 2,220 cms (85,108 cubic feet per second (cfs)), which is 190 cms (4,591 cfs) less than that prescribed by Plan 2012. Actual outflows may vary depending on hydrologic and ice conditions, as well as maintenance activities at the hydropower plants on the St. Marys River. The gate setting of the control structure will be maintained at the current setting (Gates #2 through #16 open 26 cm (10 in) each). There will be no change to the setting of Gate #1, which supplies a flow of about 15 cms (530 cfs) to the channel north of the Fishery Remedial Dike. The Board stresses that hydrologic conditions are the primary driver of water level fluctuations. Water levels of the Great Lakes cannot be fully controlled through regulation of outflows, nor can regulation completely eliminate the risk of extreme water levels from occurring during periods of severe weather and water supply conditions. 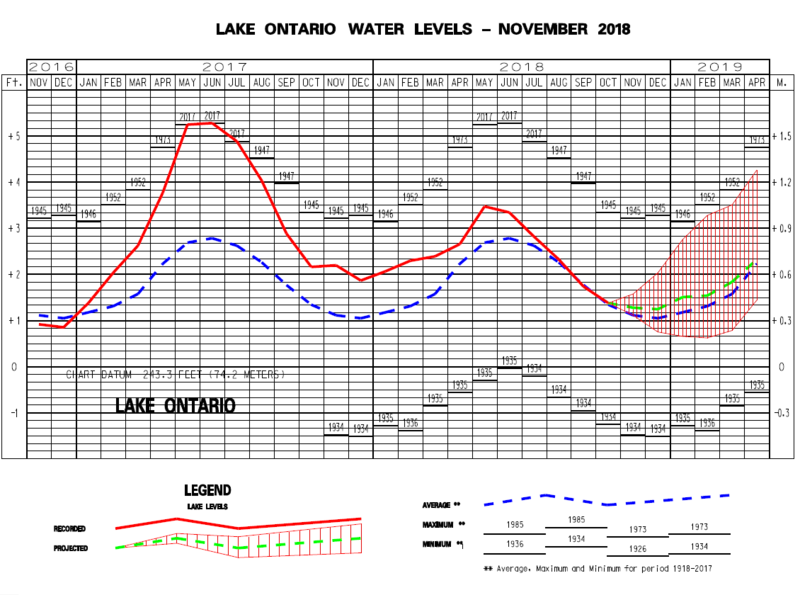 It is not possible to accurately predict such conditions weeks in advance, but given the current levels of the lakes, the Board advises all those that may be impacted prepare for the above average water levels, should they continue this winter. The above pic. from our Storm Team 8 Saugatuck Skycam was taken shortly after sunset on Sunday Dec. 30. You're looking out over Kalamazoo Lake, which is connected to Lake Michigan. Lake Superior is down 3" in the last month, down 1" in the last year, but it's still 10" above the long-term average. Lake Michigan/Huron is down 1" in the last month. The lakes were up 3" in 2018 and they are now 19" above the century average for late December. Lake Erie is up 1" in the last month, up 7" year-to-year and is now a full 24" higher than the average level. Lake Ontario is up 4" in the last month, unchanged since Dec. 2017 and is now 9" above the long-term average. Lake St. Clair is unchanged in the last month, up 5" in the last year and is now 22" higher than average. 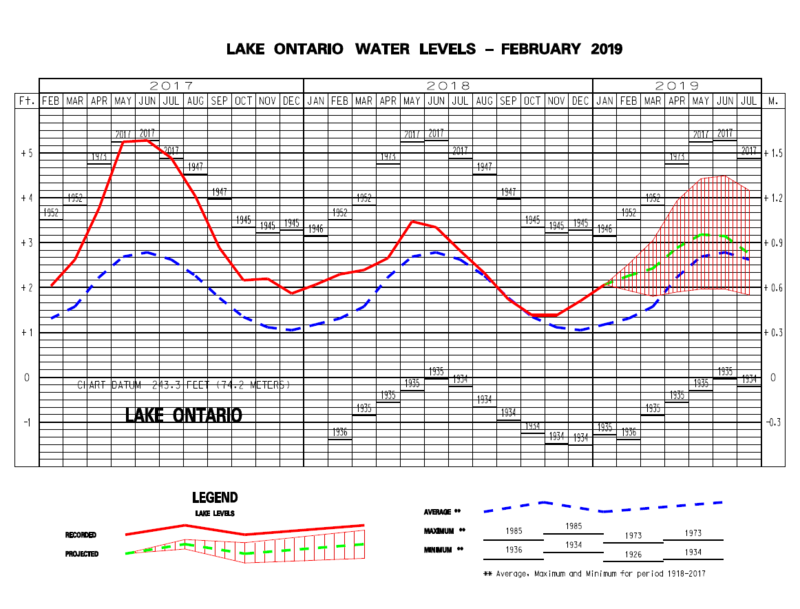 Friday January 11th (2019), the average level is at 74.81 M, the level back in January 12th (2018) was also 74.81 M. Once again depending on the amount of precipitation, we should be on track for another of the same as last year. After the disaster from two years ago, I can safely assume that the levels will be closely watched and adjusted as needed. Mother nature and the wonderful gifts she gives us. After the storm passed us Saturday and plunging the temperatures into minus 30 C come Sunday morning, we a woke to this wonderful sight ! You may call it an ice shelf, ice cap, lake ice mountains but I would like to call it an ice wall of protection. There is easily about 150' of mostly solid ice now protecting the beach shoreline all the way down from the pier to Confederation Park. Came across this article, the Army Corp of Engineers has updated their outlook for the beginning of 2019 with this announcement, see below. I also copied the previous outlook for comparison. Looks like the great lake water levels will continue to be on the high side. Water levels in the Great Lakes are expected to be above normal this spring and summer with some lakes possibly breaking records. The U.S. Army Corps of Engineers is predicting Lake Superior and Lake Erie could reach record-breaking high water levels by the end of May. The latest six-month forecast for the Great Lakes also predicts Lakes Huron and Lake Michigan are expected to be above normal but no records are expected to fall at those two lakes. These projections are based on the present condition of the lake basin and anticipated future weather. The Corps of Engineers said Lake Erie could rise by another 14 inches by mid-May to break a 1986 record. As well, Lake Superior could rise by eight inches by late May to break record levels in 1986. Lake St. Clair may be close to the 1986 record at the end of May but is expected to fall just short. 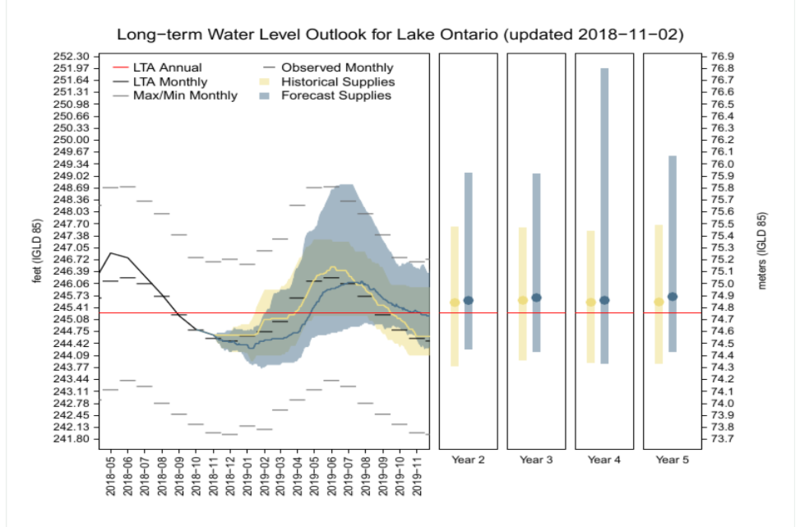 No prediction was made for Lake Ontario, where water levels are controlled. All of the lakes but Lake Superior are above their levels from last year at this time. Lake Erie is seven inches higher than last February and will rise by another inch in 30 days. Lake St. Clair is 11 inches higher compared to the same time last year and will rise by another four inches in a month. Levels in some of the lakes were at record lows six years ago. Higher water means less beach area but deeper channels for commercial shipping.